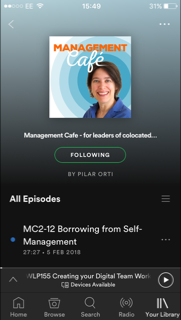 Pilar talks to Emily Klein and Jason Morwick about Workshift, how organisations can transition to a flexible way of working. "Workshift provides a detailed blueprint for organizations transitioning into the virtual workplace where employees are always connected, and work is no longer a destination." Pilar is taking part of NaNoWriMo again! How does an organisation know whether they’ve skipped a stage and are trying to make the change without laying down the foundations? How do we know what to measure to make sure that Workshift is working – at the organisational level, at the team level? When or why does Workshift fail? When do we know we’ve successfully made the shift? “Middle manager resistant to telework.” Is this still the case? Three key scheduling challenges: rigidity, unpredictability, instability. Challenges for employees: Balance between those in the office and those remote, or those doing both. Career progression, finding new opportunities: facetime – expected, extracurricular. How things have changed since 2012 when Workshift was written. Newer PostWLP54 Who's Going Remote? Older PostWLP52 Too Much Tech?